Dos exposiciones interesantes en la Birdfair de Doñana. En una, en el Centro Ornitólogico Francisco Bernis de El Rocío, las 28 obras seleccionadas para la final del Certamen de pintura de Aves que convocó SEO/BirdLife. En otra, en Dehesa de Abajo, obras de cinco artistas, pintores y escultores. En ésta última podéis ver tres obras mías, dos óleos y una acuarela. Two interesting exhibitions at the Birdfair of Doñana. The first one at the Centro Ornitologico Francisco Bernis (El Rocio), 28 works selected for the final of the Bird Painting contest organized by SEO/BirdLife. The second one, in Dehesa de Abajo, works of five artists, painters and sculptors. including three works of mine, two oil paintings and a watercolor. 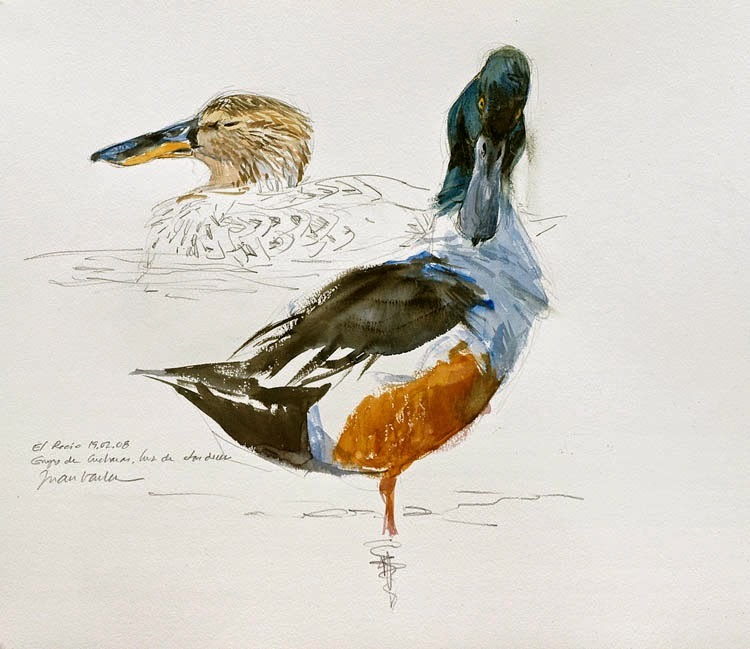 Shoveler study. One of the pieces exhibited at Dehesa de Abajo gallery.